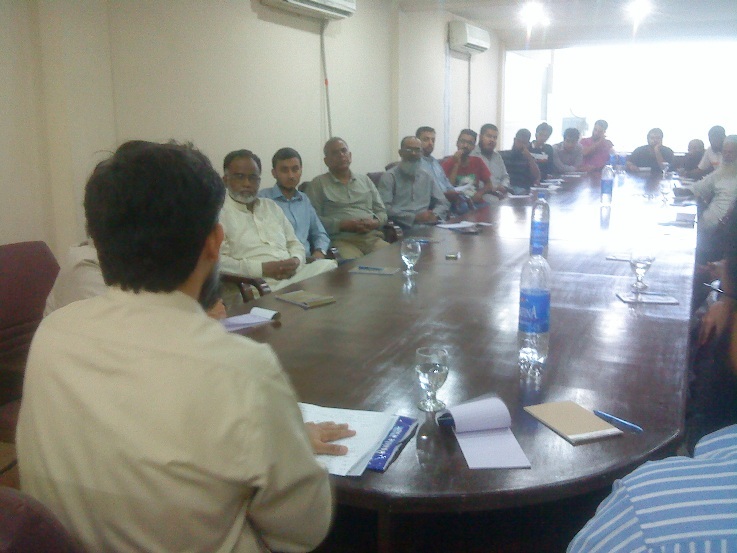 As part of its continuing campaign exposing the IMF’s budget for Pakistan, Hizb ut-Tahrir Wilayah Pakistan gathered the influential of Pakistan’s financial and industrial center, Karachi. The gathering was the latest in a series of political actions from Hizb ut-Tahrir Wilayah Pakistan as part of its campaign to save Pakistan’s economy by the establishment of the Khilafah, which have so far included leaflet distribution, a launch of a booklet about how the Khilafah will revive Pakistan’s economy, delegations, press briefings and mass contact campaign. The speaker addressing the gathering, Shahzad Sheikh, Deputy to the Spokesman of Hizb ut-Tahrir in Pakistan exposed how the Kayani-Sharif regime has slavishly implemented the IMF’s prescription for further destruction of Pakistan’ economy in the current financial year. This lethal prescription include back breaking taxation to strangle economic activity, further privatization of the crippled power sector to further raise the price of electricity and worsening government debt to weaken the Rupee through the monetizing effect of borrowing, which is the cause of the huge inflation. Shahzad Shaikh said that already, the Kayani-Sharif regime finds itself besieged by the call from the Ummah, from all its quarters, denouncing slavery to the IMF in these days. In response, the Finance Minister has issued a flurry of denials, claiming that since democracy converted the IMF demands into law, the Budget is home-grown, he said that Hizb ut-Tahrir declares this feeble defense utter nonsense. How can the government claim that democracy makes the IMF’s Haraam, Halaal for the people? How can they claim that when the overwhelming majority believes that democracy is no good for the country and instead Shariah should be implemented as the law of the land? He further said that the Kayani-Sharif is clearly blind to the needs of the aspirations and needs of the people and that is why its honeymoon period is even less than that of the previous regime, the much despised Kayani-Zardari regime. Engineer Shahzad called the people to rally around the Hizb for the serious work for the return of the Khilafah to the Muslim Lands of Pakistan.